Field-dressing this wild boar later weighed 80Kg. That’s not yet considered as ‘adult’. They turn black when adult. Every fifty to a hundred steps stood another hunter, with shotgun or drilling fully loaded. Being one of them, randomly positioned along stretches of small woods, meadow or harvested field, my thoughts did not center on what game might attempt to flee out of the drive within the range of my brother’s Winchester 101 cradled in my left arm. Rather, would my clothes keep me dry in this sprinkling rain which the substantial wind was aiming right at me. All the while, small rain beads collected on my glasses, and my nose added steadily and unnecessarily to the moisture. I had arrived a day earlier, quite jet-lagged. That Thursday a crow made its last mistake, departing from a huge and December-leafless oak tree just a tad too late. The number 5 lead hail found enough opening in the sea of branches and broke a wing bone. That little bit of action erased my jet lag for quite some time while we were checking out the roads. Helmut’s Nissan Trail (diesel) would have to maneuver them with horse trailer behind during the Treibjagd that next day, transporting a dozen hunters from drive to drive. Now the occasional shotgun blast echoed through the drizzling rain. Two deer entered the field in front of me, distracting for a few minutes from the miserable weather. Now I saw the driving hunters in their protective orange approaching. A few more shots somewhere. Soon the drivers were at my level, and I fell in with them. I never aimed at anything in that first drive. But two hares, a much tastier version of a jackrabbit, one duck and one fox came to bag. Off to the next section to be driven/hunted. As predicted, the rain decreased. On our way to our next positions my ‘guide’ ordered to fill the barrels, and move through a small section of birch trees. Sure enough, a hare bolted. The first charge of lead ripped into the green grass behind the critter as he exited onto the adjacent meadow. But my quick second rolled him. Smiles. I retrieved the rabbit, then took my position for the remainder of this drive. Soon other shots shattered the quiet. Then, at top speed, another hare exited the woods at an angle to me, raced across a section of open field, only to enter the small section of woods I stood in ambush at. For safety reasons you do NOT shoot into the drive, where, somewhere, other hunters are positioned or coming to. Therefore, let this speeding rabbit pass me. Then the Winchester flew to my shoulder for one fast shot. The hare somersaulted out of sight behind some blackberry bushes. Except that a minute later my neighbor announced that ‘my’ rabbit had gotten back up and fled. Even a later search with certified dog did not bring the speeder to bag. Huh. That’s hunting also. One more drive before lunch break. My guide, merely one of the approximately 30 hunters that day with knowledge of the area and how to position some of the guns, randomly assigned me a position along a ditch bordering a harvested corn field. Behind me open meadow, ahead and past the field, a decent section of woodland. Along that ditch were at least 4 hunters to my right, one to the left, then some eight more along the field at approximately 90 degrees. I knew of a few duck ponds near the end of the wooded section. Therefore heavy 3” magnum shells occupied my chambers. 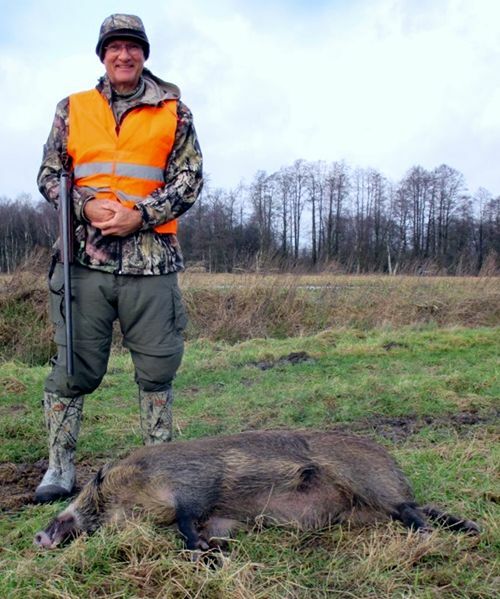 But soon after the dogs were released and the first shot fell, a sizeable wild boar emerged onto that field. Remember, can’t shoot there from here. Too far anyway. But you betcha, those Magnums came out and rifled slugs went in! I checked out that ditch immediately behind me. About man-deep with maybe half a foot of water in the bottom. Bank was darn steep. Oh wait, a few steps over I could walk in instead of jump in. Did just that, deep enough so I could barely look out. Ducks flew from those ponds. More shooting inside. Then, what I was hoping for! A wild boar emerged, ran onto the field, now directly towards my position. But darn it, no more than 40 steps before me the beast turned to my right, even past my immediate neighbor. Maybe a hundred yards from me the sow crossed the ditch, entered the meadow at full steam. No more than twenty five steps further, and Joerg Dieter’s slug felled it. A neat show to watch. Speaking of … way to my right several smaller pigs were trying their luck across the field. One collapsed as soon as it passed the nearest hunter. Another angled along the line of hunters, and many slugs and the occasional bark from a drilling rifle barrel made it run ever faster. Then it also rolled. Some of the smaller pigs were whitish with black spots. Helmut managed to bag one of them, as I later learned. More excitement for me now! Another fat thing was again running right at me. I hid deep in the ditch so I could see the pig only through the grass. And it kept coming ... coming ... I could hear it breathing now, heavily, and every slurp its legs made in the heavy wet muddy ground. At less than ten steps it must have noticed something, veered slightly to my left. Then into the ditch and briefly out of sight. I made one step up the bank. The sow emerged, not overly fast and not even fifteen steps away. The shotgun barrel swung towards its neck and the Rottweil Exact slug was out, flipping that fatso end over end. Awesome! I watched it occasionally while still monitoring the field. 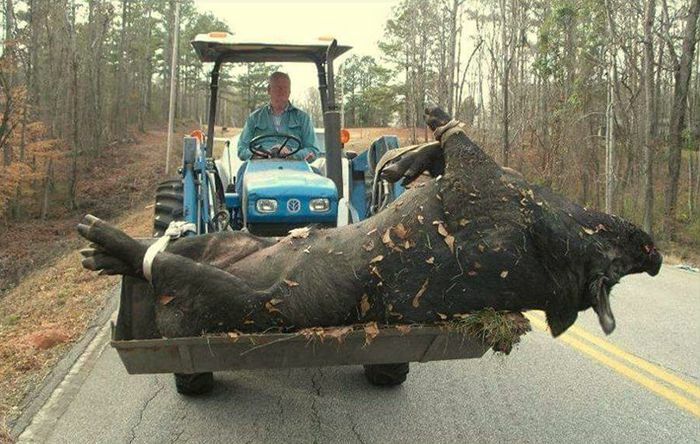 That sow was down for the count. I dropped another slug into the lower barrel. Good thing, because here came another pig, quite a bit smaller. That one crossed the ditch right between me and my neighbor to the left, so a good forty steps away from me. First slug showed no reaction, his shot ripped into the meadow. My second also failed to stop the little rascal. As I fumbled another slug into the lower barrel, somebody from far off sent a slug. It missed way behind, whirling up the wet meadow. So did my third shot, with the pig a good eighty yards off by now. Note to self: if I go to Germany again I will have to practice with slugs more. 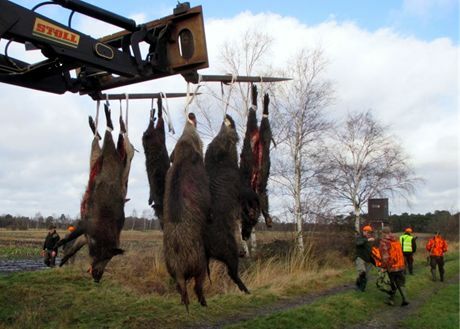 Seven pigs came to bag in that drive, killed by seven hunters. That is unusual. Typically the herd busts out at one location and maybe two or three guys got shots, and the majority of pigs escape. This time, only three escaped. After lunch we had two more drives. I nailed another hare in the first, again going full throttle. They run differently than jacks, no bouncing, only low to the ground and hauling. And the dogs cornered a small pig. It had a shot-through front leg. Most likely from one of my slugs from the previous drive, as the wound was fresh, and that critter had fled in the direction of where it now had come to bag. The last hunt of the day had the promise of more boar. Conditions allowed that I brought along the 101 and bro’s Sauer 80. Boar did come to bag, but absolutely nothing came out of the woods at my position. It got dark by 4:30 PM. Tradition followed. Late dinner, sharing of stories, and of course alcohol. With a boar and 2 hares I had the biggest bag amongst the hunters. And so they declared me “Jagdkoenig” (hunt king) for that day. Which means that I had to buy a round, and add/engrave my name to the decorative chain that is passed along year after year. The Jagdkoenig is also automatically invited for next year’s hunt. Last time I was king on that hunt was in 1980. Back then the total bag was about 150 animals, with more than 130 hares, some pheasants, ducks, pigeons and foxes. But no pigs. In 2015 the total bag was 13 pigs, 13 hares, one fox, one weasel and two ducks. Changes in agriculture, in particular the increase in corn production for bio-fuel robbed the ecosystem for small game but heavily favor wild boar. We got home at 1 AM that Friday. And at 7AM we were on our way to the next hunt, this one a two-day affair. The location was along the river Elbe, in the former East Germany. The chance of pigs was there again. Even stag were ‘free’, although unlikely to be encountered. The group with nine guns was smaller. No pigs flushed. Even worse, the local government had declared that region as sanctuary for waterfowl, and closed that season by end of November. Going after geese in particular had been a highlight of this hunt. It will be held in November in 2016. At the end of those two days the ‘take’ was 10 hares, three foxes and five raccoons. I had the fun of rolling two high-speed hares. And partaking in the tasty old country food. It would take me several pages to list and describe all the good stuff you simply will not find here. I did not lose weight in Germany, never have . Then things slowed, and only my brother and I went out for a few hours here and there. The weather remained windy with the occasional drizzle. At least two stalks at deer failed. Such were the conditions when we found a herd of roe deer out in an open meadow. Helmut said I could go after a doe. Best way to get closer was along a meadow fence row. Going very slowly because I was basically fully exposed, the presence of the fence posts must have made it look like I was just one of them. The wind was dicey, quartering between me and the deer. Probably took a good fifteen minutes to advance by a hundred yards. But the deer remained clueless. Plus, they sort of came my way as they were feeding. That closed the distance to well within reach of the .222 Rem I was carrying. It also caused a dilemma. For me the only way to tell what is a doe is the rear end. A doe shows an obvious tail, a buck doesn’t. After long waiting, by now resting on the second-to last fence post, one deer turned back. It was a doe. Of course then she did not go broadside for an equally long time. And when she finally did, she turned 180, instantly facing me, feeding towards me. I had the Leupold 3.5-10x50 cranked to 10x. When that doe was within about 80 paces I began to aim for her. Turns out that her head appeared quite large in the scope. So after she once again put her head down for another bite, I squeezed. Next thing I saw was legs kicking spastically, and the rest of the herd panicking away. The 52 grain HP had entered between the ears and exited with a fist-size hole at the base of the neck – perfect for the kitchen. Two evenings later we waited near where Helmut had seen deer come out of the woods at last light a week prior. He invited me to take one more doe. Sure enough, at near last light a deer came onto the field. Same waiting game until I could confirm she was a she. This one allowed a broadside shot, from about a hundred paces. 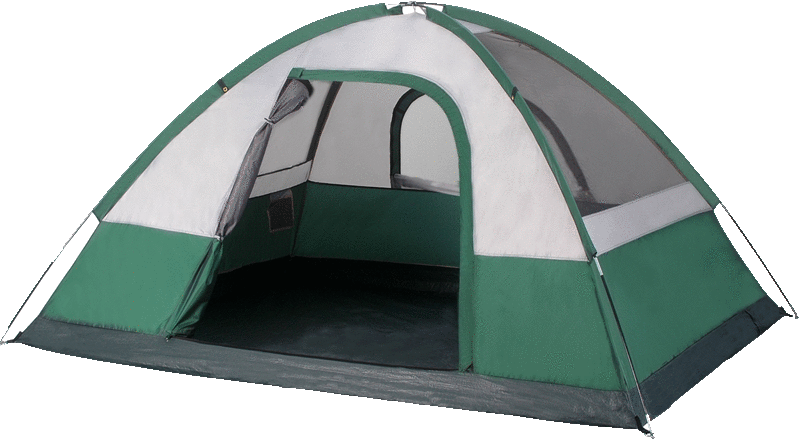 The .222 barked, and she ran back towards and into the woods, but slowly. We marked that location of entry and waited 20 minutes. Then we followed and found her not even ten steps in, expired. We later recovered what was left of the HP which came to rest at the offside hide. I enjoyed both deer a lot with the circumstances to bag them. That was not the end of hunting. My last Saturday there (same day as our Turkey shoot in AZ) would be spent at a Drueckjagd (drive hunt for big game). Twenty two hunters and a few drivers were present. Roe deer doe, fallow deer yearling and of course pigs were the objective, plus foxes and raccoons. 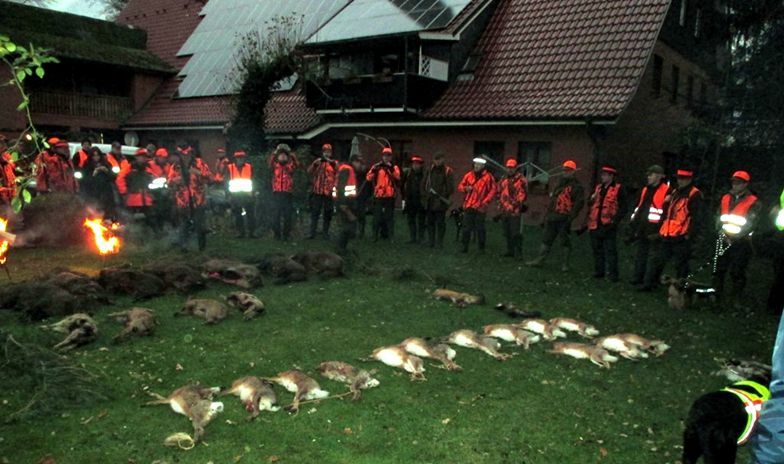 At the end of that day the “Strecke” (bag) was 10 pigs, two deer and three foxes. But both Helmut and I never even brought the rifles to our shoulders. After dinner that evening I got more invitations for ‘next time’. That alone is intriguing, of course. Now add to that what somebody in Czech Republic bagged. That’s not too far away from Germany for a pig that size! I’m making 2016 plans.